Of all the skills I’ve picked up over the last few years, learning how to design a printed circuit board (PCB) has been one of the most useful. Up until a few years ago, all my circuits existed on an insertion style protoboard. Any other circuit that I actually had to solder together was done on a prototype perfboard and always looked like a giant sneezed the components together on to a small wafer. Mechanics and craftsmanship have never been my strong suit but then I found KiCad. 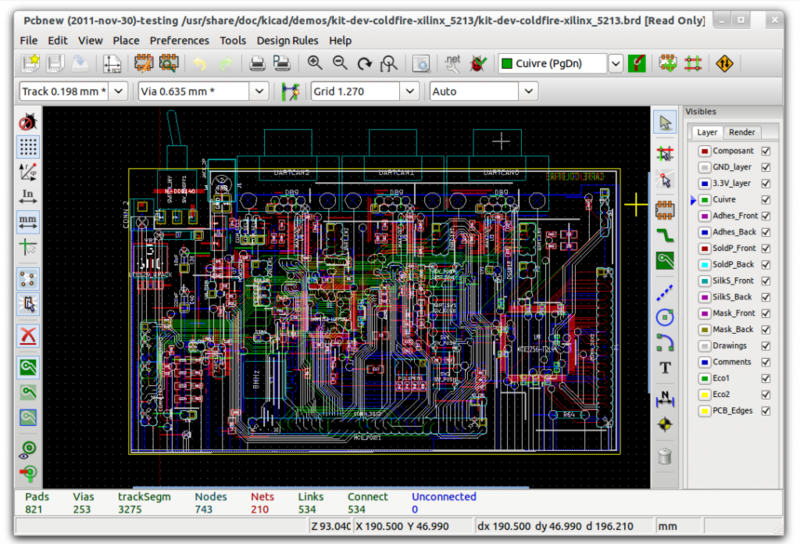 Kicad is a design software used to put together your very own, professional looking PCB. It’s open source and available on a host of operating systems. Make a Schematic – Kicad’s schematic program, eeschema, lets you build and connect your circuit from preexisting schematic symbols in the Kicad library. It also allows you to design and add any components you don’t find in the library. Assign a Component Footprint to Each Symbol on the Schematic – In this step you are picking component layouts and matching those to the correct schematic symbol. For instance, let’s say you have a resistor on your schematic called R1. In KiCad you have to define the footprint of R1 in a program called CvPcb. Is it quarter watt resistor sized, half watt, 5 watt? Luckily the CvPcb program already has many standard component sizes defined in it’s library. The footprint you assign to the schematic symbol will define the solder pad layout for that component. Arrange Each Footprint on Your Circuit Board – In this third step it’s time to arrange each footprint on the circuit board using the Pcbnew program. This program also allows you to connect all your components together with circuit board traces. Because you’ve already defined how the components connect to each other on your schematic, Pcbnew can connect all these points automatically. In the final few steps of the Pcbnew program, you ask it to generate the appropriate files and you’re done. These files can be sent to manufacturers like OSH Park. For $5 a square inch, you get 3 copies of your circuit board. After the first iteration of this article went live, it was brought to my attention (thanks Todd) that downloading Kicad is not intuitive. It is very easy to download the beta applications that are very buggy, but you really must dig for the true, solid version of the application. Follow this link to get the stable Linux or Windows version. There are two videos on YouTube that are fantastic for learning KiCad. Some of the buttons in the software have changed a bit, but these videos are still great. They’re posted below but I’m going to warn you first: Robot Voice. I’ve found KiCad to be very helpful. When I started using it, I was reminded how much I love CAD. Unlike the tape measure I used to hang the bookshelves and curtains on my wall, CAD software gives me the ability to be absolutely precise. So for every one of you who are as OCD as I am, enjoy!